Shields has more than 30 years experience repairing and maintaining asphalt parking lots and right of ways for churches, industrial parks, schools, mobile home parks banks and shopping centers. Expert maintenance requires on target assessments of surface conditions and prompt response so small problems do not become major headaches. This attention to detail reduces surface aging and results in substantial cost savings over the life of any pavement structure. Asphalt repairs require an entirely different set of responsibilities. Unlike new paving, these jobs are usually performed at ongoing places of business s where public safety and tenant convenience are vitally important. Shields professional team will work with you to coordinate your job safely with minimal disruption to your business. Let Shields Asphalt breathe new life into your surface deteriorated pavements with our efficient and preventative seal coating services. We'll use the most advanced equipment to perform your project, whether it requires a spray or squeegee application. We offer a range of eco-friendly applications and will apply the product of your choice. The forces of nature break down all asphalt surfaces eventually. Unless your driveway is adequately maintained, potholes and cracks will appear, causing increased damage as water intrudes deeper into the asphalt. Crack filling and pothole patching are essential in addition to sealcoating for long-term pavement protection. 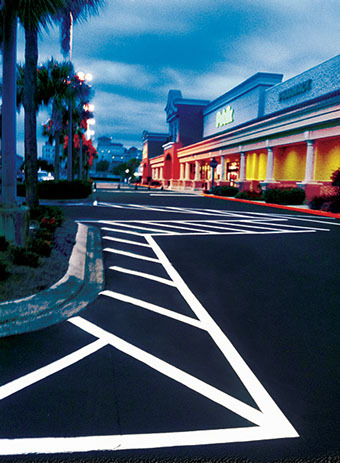 Shields Asphalt Coating, Inc. has the most up-to-date equipment for striping and markings for fast and efficient performance — whether it's a small or large parking lot. We also offer glass beads and thermoplastic required striping and markings. Our paint is tested for the best quality and greatest longevity. Shields Asphalt Coating, Inc. has all the latest stencils and signs that meet the code requirements for any required markings by the customer, including fire lanes, handicap, stop signs, glass beads, no parking and numbered parking. Car stops act as a barriers to prevent vehicles from hitting or parking too close to walls, doors, windows and other parts of buildings.